That the 2019 Hyundai Santa Fe name now applies to a spacious, five-seat family crossover SUV is no surprise. For Hyundai, “Santa Fe” is kept for the people-pleasing tall wagon that’s less offensive than Thomas Kinkade. 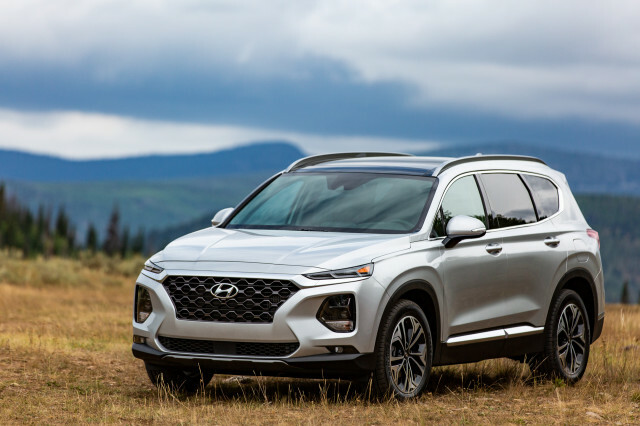 The automaker’s blitz of new SUVs to complement its once-bare cupboard of crossovers means that seemingly every month Hyundai rolls out a new name: this month is the Santa Fe. Next month it's the three-row Santa Fe XL. The fuel-cell Nexo’s next. Then a big Palisade later. There’ll be more, too. 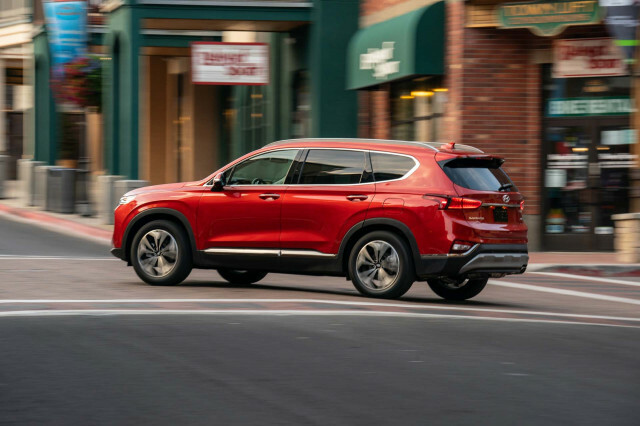 But the most recognizable name in Hyundai’s stable is now planted firmly on the most agreeable: the 2019 Hyundai Santa Fe is a spacious crossover SUV for five people, with plenty of room for gear. Its price is comparably low, and its value is high. Like others in its class that start for less than $30,000, the Hyundai Santa Fe isn’t overwhelming in many respects. 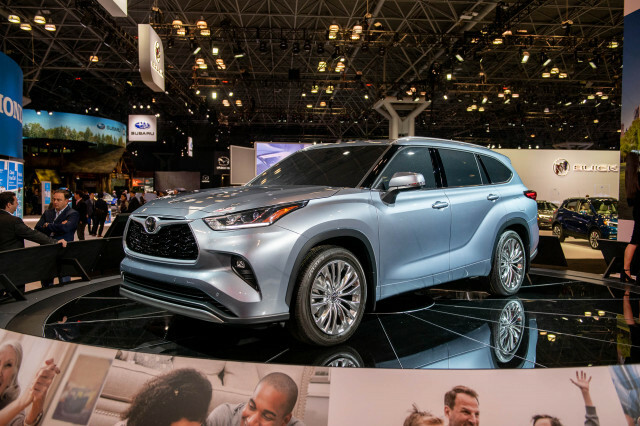 Powered by a base 2.4-liter inline-4 with 185 horsepower or optionally a 235-hp 2.0-liter turbo-4, the Santa Fe turns toward efficiency with a new 8-speed automatic and a host of light-weighting measures to strip it down to its skivvies. It’s not particularly fast behind the wheel—even with the turbocharged engine—nor is it as nimble as others such as the Mazda CX-5. 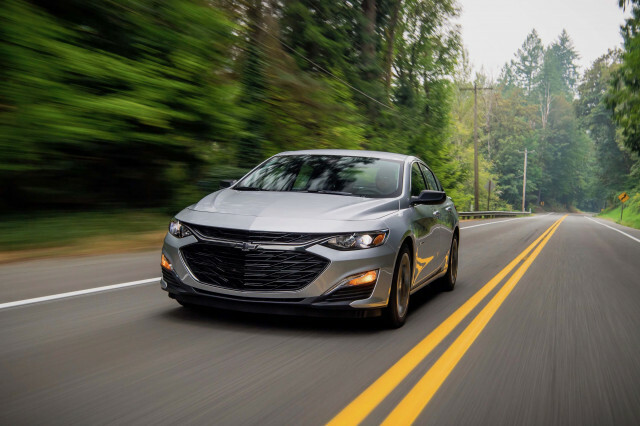 The eager 2.0-liter turbocharged engine is tempered by an efficiency-minded 8-speed automatic, and the base 2.4-liter inline-4 is even more relaxed. The Santa Fe calms to a low boil at highway speeds, ready to eat miles and deliver us to grandma’s house before dinner, on time. 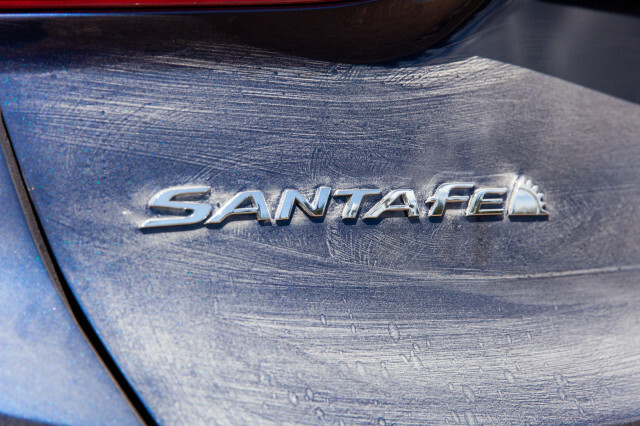 The new Santa Fe is composed of more high-strength steel that makes it not only lighter, but also stronger in a crash. Active safety features such as automatic emergency braking, active lane control, and blind-spot monitors are standard on all trims too. Crash-test data isn’t yet in, but Hyundai’s record of multiple Top Safety Pick+ award winners should be an indication of things to come. But the Santa Fe now goes further, figuratively and literally, with people and gear. 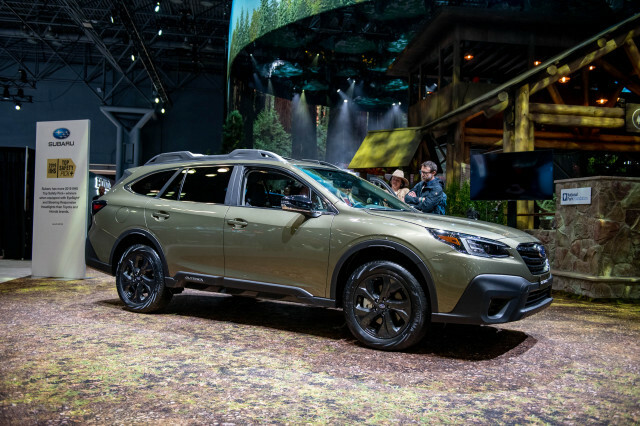 It boasts a spacious interior for five that features more than 40 inches of rear seat leg room and more than 30 cubic feet of cargo with the rear seats in place. 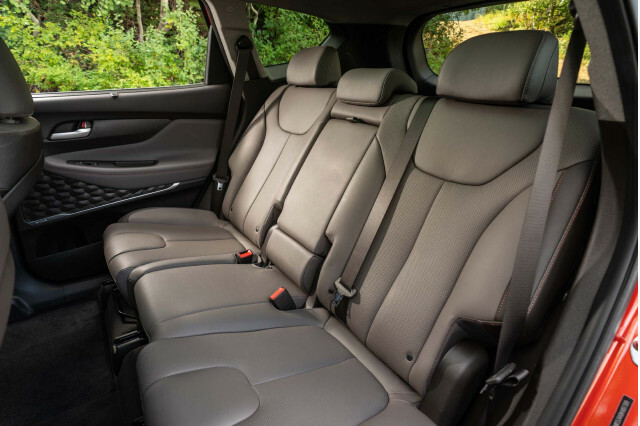 Offered in SE, SEL, SEL Plus, Limited, and Ultimate trim levels, the Santa Fe lives its best life in the top two trims, which feature leather upholstery, a 7.0- or 8.0-inch touchscreen with smartphone compatibility, panoramic sunroof, and even available all-wheel drive. 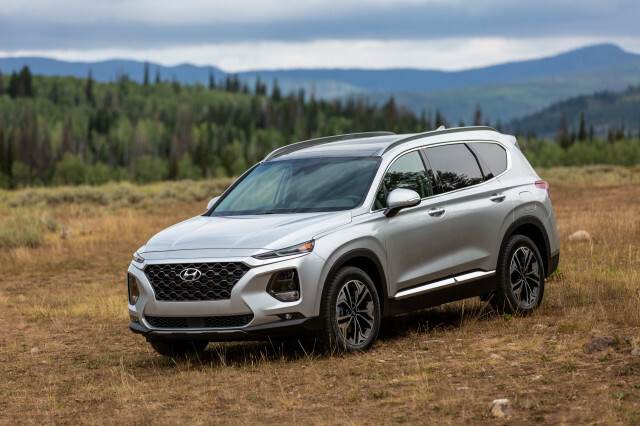 The 2019 Hyundai Santa Fe Limited starts at $33,580 with front-wheel drive and a 2.4-liter engine, all-wheel drive and a turbo-4 add $1,700 and $1,600, respectively. 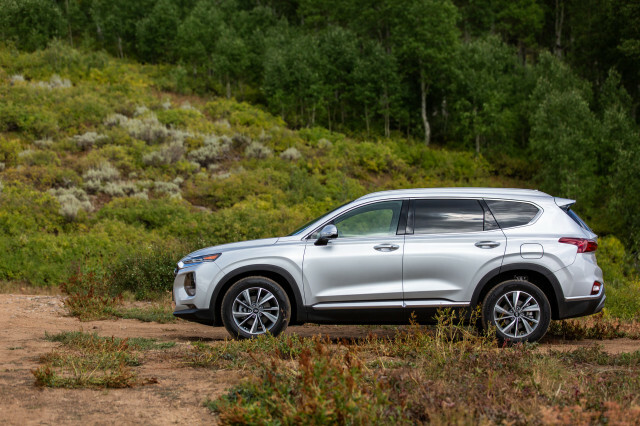 Our turns behind the wheel of the 2019 Hyundai Santa Fe were in an Ultimate edition, spec’d with a 2.0-liter turbo-4 and all-wheel drive. 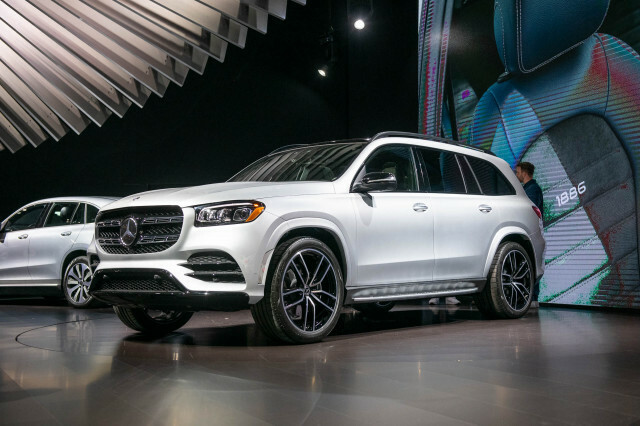 All-in, it cost less than $40,000 and featured leather heated and cooled seats, an 8.0-inch touchscreen for infotainment, premium audio, panoramic sunroof, digital information cluster for the driver, and wireless smartphone charger. At more than 8,000 feet, the 2.0-liter turbo-4 mitigated the lack of available oxygen with decent acceleration and better passing. The turbo-4 has plenty of pull, but a new 8-speed automatic may get better soon with more programming and better integration into Hyundai’s already-established powertrain lineup. 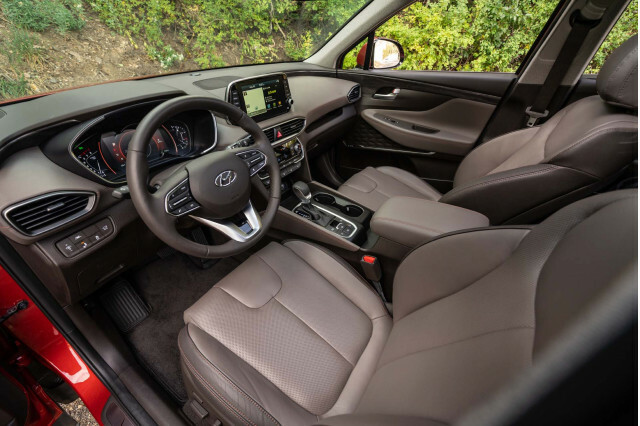 Quiet and calm at cruising speeds, the Hyundai Santa Fe is exceptional at the little things: a smartphone cutout in the dash has a grippy mat for the passenger’s cellphone, the small cubbies in the doors and around the front seats perfectly fit snacks and bottles, two USB chargers up front won’t be sacrificed to rear-seat riders who have their own pair in the back, too. 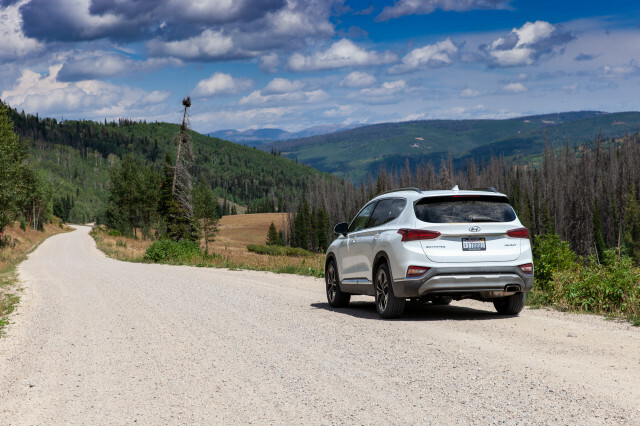 Being driven in—not driving—the 2019 Hyundai Santa Fe, may be the crossover’s best quality. There’s enough room in the cabin for four adults—five in a pinch—and 6-footers can easily sit behind 6-footers. 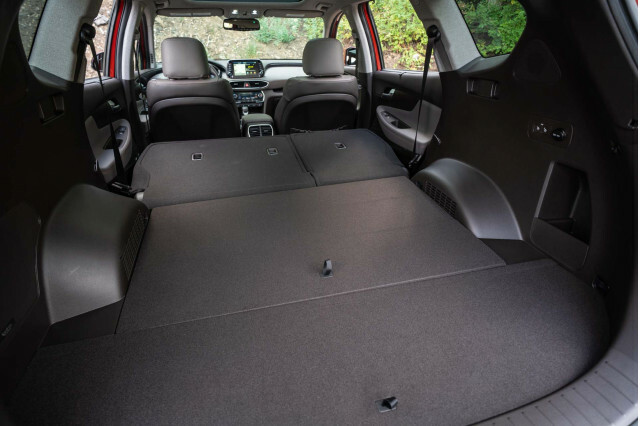 Nearly 36 cubic feet of cargo space with the rear seats up is complemented by and available motion-activated tailgate and wide opening. From the inside, the space and relative luxury is enough to forget that the Santa Fe is a Hyundai—even more that it’s priced at hundreds, or even thousands, less than the competition such as the Ford Edge and Nissan Murano. 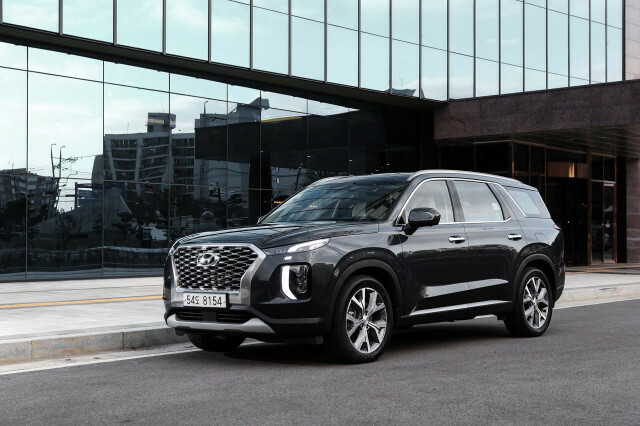 With a newly redesigned exterior, Hyundai is convincing others in the competitive class that the new Santa Fe is more than the previous versions, which were a bland exterior wrapped around a milquetoast powertrain. The new Santa Fe is a competitive crossover that looks more “SUV” in its approach and running gear, with a smart interior and better warranty. 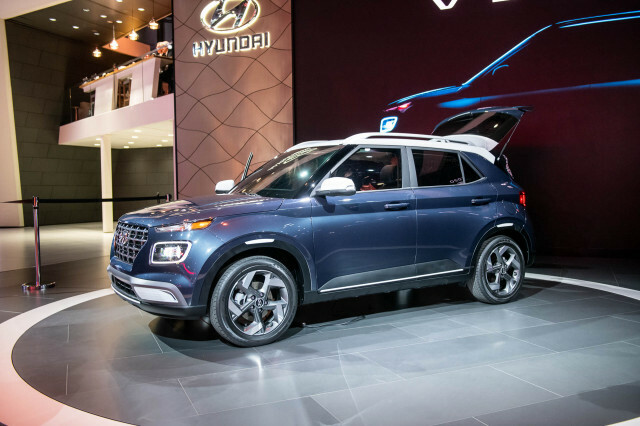 Perhaps they should have called it the “Hyundai Bargain” if they’re considering yet another new name. Hyundai provided travel and lodging to Internet Brands Automotive to bring you this firsthand report.